American Avocet by Syl Lobato - 8.000" x 6.125"
American Avocet art print by Syl Lobato. Our prints are produced on acid-free papers using archival inks to guarantee that they last a lifetime without fading or loss of color. All art prints include a 1" white border around the image to allow for future framing and matting, if desired. 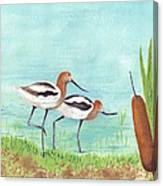 There are no comments for American Avocet. Click here to post the first comment. 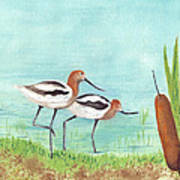 These sophisticated birds are American Avocets, with their delightful colors and an unique curved bill that allows them to skim the water surface for food, like small minnows and other living creatures. Their legs are long and give them the appearance of walking on stilts, We are see them in early spring as they are passing through Pagosa Country. 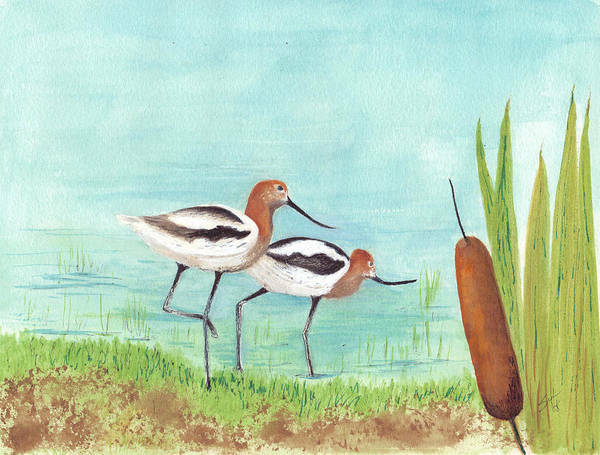 They were a delight and challenge to paint in water color with some pen work.